A big and important part of the outdoor life is the meals. A full stomach is key for a nice experience. It doesn’t matter if the sun is shining and the views are spectacular if you are hungry. Our bodies needs slow carbohydrates to fuel our muscles over time. In time of temporary dips fast carbohydrates like fruits, nuts can help and give us that extra energy to regain the smile. Besides the meals is a nice and social event. Presented below is some tips and suggestions on meals to bring. 2 liter per day and person. Bring extra water in case you’ll have to stay out longer than planned. The water is great to store in water bags or small foldable bottles that doesn’t take space when empty. Müsli & Yogurt/Soygurt/Oatmilk – empty and share one container at a time. Boil some extra water in a termos for later. You can als prepare some nuts, raisins, dried fruit, dark chocolate in case someone gets tired during the kayaking. ps. Boil some extra water in a termos for later. The first day you can eat fresh fish, the second day light smoked, followed by hard smoked and finally tinned, conserved or dried food. Fry the food in olive oil since it lasts good in heat and consists of good acids. Bullion, tomato puree, salt & peppar and other favorites spices. If you don’t want to dry your own food there is a wide range of dried and conserved meals to by. The only thing you will have to do is add hot or cold water. These meals contain all you need and don’t take much space to store. The biggest advantage is that you can still get a warm meal even if there is a fire ban and you only have cold water, see video below. 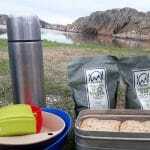 At our main centre in Grönemad, Grebbestad we sell outdoor meals from Blå band and OutMeals.